Courage. 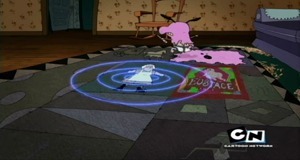 Courage the cowardly dog the Quilt club. Coureage is his boys underwear.. Wallpaper and background images in the Courage the Cowardly Dog club tagged: courage the cowardly dog. This Courage the Cowardly Dog fan art contains 거실, 앞 룸, 응접실, 프런트 룸, 앞 방, and 소. There might also be 패밀리 룸, 굴, 덴, 객실, 응접실, and 소.